Hope is the ability to hear the music of the future. Faith is having the courage to dance to it today. “We have servants, who serve us, but they serve others. We buy our food, but they grow theirs. We have walls around our property to protect us; they have friends to protect them." After church, where she had been taught about the Second Coming, a little girl was quizzing her mother. "Mommy, do you believe Jesus will come back?" "Could he come this week?" "Could he come in the next hour?" "Mommy, would you comb my hair?" Boss... "I saw you arguing with that customer. Don't you know that our policy is 'The customer is always right?'" Employee... "Yes I do, but he insisted that he was wrong!" 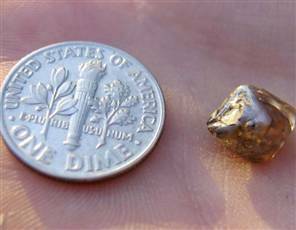 Walking along a path taken by thousands of others at the Crater of Diamonds State Park, Arkansas, Nicole Ruhter noticed something everyone else had missed - a tea-colored, 2.93-carat diamond. Ruhter, 13, of Butler, Missouri., said she would name her find the "Pathfinder Diamond" after pulling what she described as a broken pyramid from the ground. .
"We were walking through the path and I just walked and saw this little shine," said Ruhter, who has just finished the seventh-grade. "We wrapped it up in a little dollar bill and took it back and showed them." Ruhter said both park rangers and her vacationing family got excited about the diamond, found along a service road. “So far this year, visitors to the park have found 332 diamonds, three of them Tuesday alone.” said Bill Henderson, assistant park superintendent. While the park does not do appraisals, Henderson said experts appraised a 4-carat diamond found previously in the park between $15,000 to $60,000. Henderson said Ruhter's diamond did have chips and several imperfections. For now, Ruhter and her family said they'd keep the diamond for a time and find out how much it is worth before attempting to sell it. I just want something,'" Ruhter said. "Ten minutes later, I just found it." Crater of Diamonds State Park is the world's only diamond-producing site open to the public and visitors are allowed to keep the gems they find. On average, two diamonds are found each day at the park. The largest of the 25,000 diamonds found since the state park, established in 1972, was the 16.37-carat Amarillo Starlight, a white diamond found by a visitor from Texas in 1975.